Bhaya Cruises offers 2 days Halong Bay tours for travelers who wish to experience this World Heritage site within a limited time frame. Take a short and insightful trip to one of the most visited sites in Vietnam with our Halong Bay cruise packages. Book your trip with Bhaya Classic Cruises today to enjoy a charming and luxurious journey through one of the most beautiful bays in Vietnam! Other airfare, visa, transfer and hotel arrangements not clearly noted as included. 07:30 - 08:00 Optional pickup service by shuttle bus. Start departure from Hanoi. 12:00 Arrive at Bhaya Group Cruise Centre at Tuan Chau International Passenger Port. 12:45 Embark your cruise onboard Bhaya Cruises. Enjoy welcome drinks while our Cruise Manager does the itinerary and safety briefing. 13:00 Let the vacation begin with a tasty lunch while the boat cruises towards the southwest of Halong Bay. 16:00 Arrive at swimming area. It’s time to immserse youself in the emerald green water of Halong Bay. 17:00 Bar opens for the Happy Hour "Buy one get one free". Take the chance to get more delicious drinks and fun. 17:30 Join exciting “Master-Chef Competition” and fruit carving demonstration, learn and try your hands with authentic Vietnamese food. The winner or the Master-Chef of Bhaya Cruise would be awarded surprising gifts. It’s also time to admire the sunset over enchanting Halong Bay while the boat anchors for an overnight stay. 19:00 Enjoy set-menu dinner on board while your Cruise Manager introduces the following day program. 21:00 Retire to your cabin or join our staffs for squid fishing. Overnight on board. 06:15 Start off your day with a Tai Chi lesson on the sundeck with complimentary tea and coffee being served. Rejuvenate your body and mind with the slow movement of Tai Chi and enjoy the dawn on the bay. 07:00 Light breakfast is served onboard. The boat weighs anchor to sail to Cua Van floating fishing village. 09:00 Return to your boat and relax. Enjoy the brunch before checking out. 10:45 Disembark at Tuan Chau International Passenger Port. Leave for Hanoi. Cruise itinerary and schedule are subject to change due to weather, tide levels and operating conditions without prior notice. Swimming or kayaking excursions may be cancelled due to poor weather. Kayaks can be booked in advance at reception at the cost of 10$/trip. Meals on board are fusion: Vietnamese, seafood & international. Guests should advise of any special food preferences, allergies or dietary requirements at least one (01) week prior to the cruise date. Advance registration is required with your full name, date of birth, nationality, gender, passport number and visa expiration date for all passengers. A valid passport is required upon check-in. Otherwise, boarding may be denied by port authority. Wifi is available on board free of charge in the terrace deck. However, regular interruption is expected due to nature of internet signal at sea. There is no charge for cancellations made more than 7 days prior to the cruise departure day for online bookings. We loved this 2 day, 1 night cruise around Ha Long Bay. It was very relaxing and the food was superb (when isn’t it in Vietnam!) There’s about 35 people on board sleeping in 22 cabins and it’s a real mix of travellers. Great opportunity to meet new people and observe different cultures mixing. We had the hipster Germans, the aloof Poms, the cheeky Australians, the suave French, the quiet Vietnamese and the embarrassed Yanks all together with us humble New Zealanders. Good for chat and cultural observations. The crew were great, the boat is comfortable and the scenery was superb. We drove on a bus (4 hours) from Hanoi to Halong Bay and boarded the Bhaya Classic II junque for a two day one night excursion in Halong Bay. I only wish we had more time, it was nothing short of fantastic! The stunning scenery is incomparable to anything we have ever seen before and the water is a lovely shade of emerald or teal green. Once on board the junque, we were given our cabins which are quite adequate for a night. Then we were served a sumptuous lunch as we began to sail into the bay. The scenery is so stunning people kept jumping up from the tables and running out to take pictures. In the afternoon we had a choice of kayaking or getting into a rowboat to see a fishing village. After that we were brought to an area to jump off the junque to swim in Halong Bay. That was wonderful and we'll never forget it. They gave a cooking demonstration on the deck before dinner, how to make deep fried spring rolls and then turned it into a fun contest. We were served a 6 course meal for dinner and then squid fishing afterwards. Later in the evening a demonstration of how to make tea was given and it was very interesting. The following morning there was Tai Chi on the deck, followed by a very light breakfast then boarded a tender to do a tour of some caves. On return to the junque a full breakfast was served. The staff are all young and they are just amazing! We loved every single second on board the Bhaya Classic II and only wish we had more time to enjoy her and Halong Bay, a Unesco Heritage new wonder of the world. Excellent adventure. Great natural wonder, superb service. Great food, clean,everything was well planned. 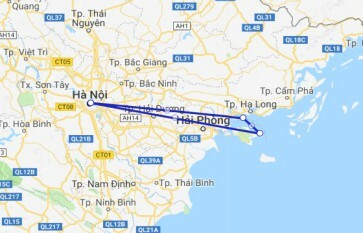 Just super way of seeing the Ha Long Bay. We recently travelled on Bhaya Classic 3 for the 1 night 2 day trip. We had the most amazing time and were pleasantly surprised by how luxurious, clean and comfortable the boat was. The food was delicious and they provided many great options for one of us who was a vegetarian. There were also many great drinks to choose from and we especially loved 2 for 1 cocktails during happy hour! The highlight of our trip was the amazing staff who were so helpful and approachable and helped to make the experience more exciting. They were also very entertaining and knowledgeable on the organised activities. Special mentions go to Tom “Cruise” and Iris. 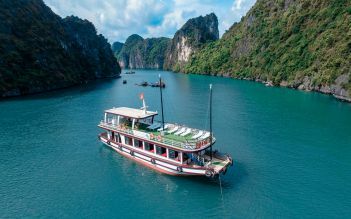 We would definitely recommend this tour to anyone wanting to see Halong Bay!